Project managers for the British Beagle lander program areseeking redemption - on the moon - nearly six years after their spacecraftdisappeared on Mars. Collin Pillinger who headed the unsuccessful Beagle Marsproject is in discussion with the commercial "Odyssey Moon"program to fly a backup version of Beagle's most powerful instrument on boardthe Odyssey lunar lander. When lost in December, 2003, the BeagleMars lander was seeking organic materials that could have been evidence ofpast life. But the Odyssey Moon program is seeking evidence for lunar resourcesthat could be mined by future astronauts seeking profit. The Beagle project's magnetic mass spectrometer isespecially suited for finding such molecules, says Everett K. Gibson a NASAsenior geochemist and astrobiologist at the Johnson Space Center. Gibson hasled Lunar Beagle studies at JSC, where the lunar version of the spacecraft hasbeen tested. A similar Pillinger instrument is on board a European Space Agencyspacecraft headed for a landing on a comet. Years before the OdysseyMoon program came calling, the Beagle Mars program had already convertedits backup hardware into a "Lunar Beagle" configuration for a NASAstudy on low cost robotic lunarconcepts. Those study results remain viable and theoretically could resultin a NASA Lunar Beagle type mission in several years, says Gibson. Top NASAheadquarters personnel disagree, however. The Odyssey Moon commercial lander and rover are underdevelopment at MacDonald Dettwiler and Associates (MDA) in Canada usingCanadian technology mated with a NASA spacecraft design already tested at theNASA Ames Research Center. Top new U. S. personnel and hardware are also being added.Jay Honeycutt former director of the Kennedy Space Center has been hired aspresident of Odyssey Moon Ventures, responsible for all U.S. operations andlaunch programs for the lunar surface venture. He is based near Cape Canaveral. Another major appointment to boost the project's stature isthe hiring of Alan Stern, a highly experienced manager and engineer who waspreviously NASA associate administrator for science. Another top official isPaul Spudis, previously chief scientist at the Lunar and Planetary ScienceInstitute in Houston. He has just been hired as Odyssey Moon's chief scientist. "For a number of months we have had contact withOdyssey Moon and in early July we had "more firm" discussions,"Pillinger tells Spaceflight Now. "They are interested in our massspectrometer, but arrangements are still tentative at this moment." The Beagle magnetic mass spectrometer has a strongcapability to find and analyze volatile species like hydrogen and water ice andother molecules that would be critical for discovering and using lunarresources Gibson told Spaceflight Now. Christopher Stott, a senior executive with Odyssey Moon hasheld the discussions. Stott was previously a manager with Boeing on the DeltaIV and later with Lockheed Martin Space Systems where he helped leadinternational sales efforts. Further discussions with Stott may be delayed a few weeks,however, because his wife, NASA astronaut Nicole Stott, is set for liftoff Aug.25 on the space shuttle Discovery. She will be delivered to the ISS for aseveral month mission on board the outpost. Odyssey Moon is one of 16 competitors in the Goggle Lunar XPrize competition that will award $30 million to the first team to fund asuccessful commercial robotic lunar landing. The winner must also demonstratethe ability for the mother ship or its rover to drive at least 500 meters(1,650 ft.). The Odyssey Moon team was the first to register for the prize.From all outside appearances at least, it has already amassed a strong investorand engineering team. That includes signing an agreement with NASA forcommercial use of a NASA lunar spacecraft that has already been designed andtested at the Ames Research Center. The mission will cost about three or four times more thanthe prize money. But Odyssey Moon is focused not on just one flight, but anongoing series that has lunar prospecting goals as well as science objectives. 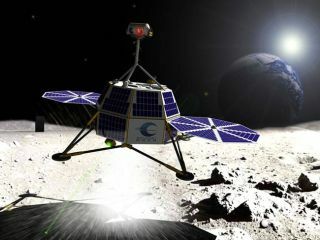 Odyssey Moon had been planning to launch in 2011. But thecompany indicates that launch of the first commercial robotic lunar lander"MoonOne" (M-1) will likely slip by a year to at least mid 2012. Use of a Minotaur V or SpaceX Falcon 9 launch vehicle fitswith the mission needs, although managers decline to discuss their launcherplans. Either rocket can deliver payloads of 5-50 kg to the lunar surface or10-200kg to various lunar orbits, Ames studies indicate. "I am extremely pleased and excited to be working ongetting us back to the Moon in a sustainable way," says Honeycutt. "Ibelieve the private sector has an important role to play in a permanent andaffordable lunar program." He has over 40 years of space experience, including keyengineering and simulation positions at the Johnson Space Center during Apollo,Director of the NASA Kennedy Space Center and president of Lockheed MartinSpace Operations. Honeycutt will specifically focus on the commercializationof the NASA technology like the new Ames Common Bus lander. This should enableOdyssey to develop a series of robotic landings specialized for specific tasksat different landing sites. Odyssey's MoonOne (M-1) lunar lander will use utilize theAmes Research Center design for a modular Common Spacecraft Bus. Under the terms of a Reimbursable Space Act Agreement withOdyssey Moon Ventures LLC, Henderson, Nev., NASA Ames will share its smallspacecraft technical l data and expertise with the company. In return, Odyssey Moon Ventures will reimburse NASA Amesfor the cost of providing the technical support and will share its technicaldata from its engineering tests and actual lunar missions with NASA. "NASA is a big supporter of developing the commercialspace sector, and is interested in developing small spacecraft for future lunarexploration," says NASA Ames Research Center Director Pete Worden. Bymaking these designs available to commercial enterprises, we hope to spark rapiddevelopment of low-cost, small spacecraft missions." NASA also will share data from the Ames Hover Test Vehicle,an engineering prototype to evaluate hardware and software systems. The GoggleLunar X prize leaves open how each contender achieves 500 meter mobility. TheAmes test vehicle, however, has demonstrated that it can not only land, butalso rise off the moon and fire small thrusters to move sideways. This raisesthe possibility that the Odyssey lander can achieve the mobility of a rover, atleast to win the $30 million prize and bragging rights that will go with it. The Odyssey Moon venture is domiciled on the Isle of Man"to take advantage of favorable regulatory and export regimes that allowus to choose the best technologies and partners from around the world,"the company says. It is actually headquartered in the U. S. in Henderson,Nevada with offices also in Washington, D. C. as well as the Cape. Pillinger headed the Planetary and Space Science ResearchInstitute at England's Open University. After Beagle disappeared without a trace a Britishinvestigation sharply criticized the project's management and testing but thespectrometer was not faulted. The first mission will be focused on assessing resources indark mantle near the lunar equator. The second mission will be to the lunarSouth Pole and focused on a direct ground level search for water-ice. One potential equatorial target is the moon's SulpiciusGallus region where analysis indicates there is extensive dark mantel. Thematerial could produce extensive "feedstock" for the production ofhydrogen and oxygen. The region is more than 100 mi. north of the Apollo 11landing. Another option is Rima Bode, rich in black volcanic glassand thorium. U. S. Geological Survey scientists say that it too could be amajor lunar mining area in future decades. The area is near the Apollo 14landing site. Images taken by the Lunar Reconnaissance Orbiter are helpingto narrow other potential landing sites. Odyssey Moon is also extensivelyinvolved in support of and use of 45 year old NASA/Boeing Lunar Orbiterimagery. Data from those spacecraft are being to extract major new highresolution data as part of the Lunar Orbiter Image Recovery Project. The program's CEO, Robert Richards, is the director ofToronto based Optech Inc. the global market leader in the development, ofadvanced, laser-based survey systems. He also helped found the InternationalSpace University. The chairman of the Odyssey board is Ramin Khadmen who helpedfound Inmarsat and was Inmarsat Chief Financial Officer. Mr. Charles M. Chafer - CEO, Space Services Inc.
Dr. David Miller - University of Oklahoma's Wilkonson Chair Professor inthe School of Aerospace and Mechanical Engineering specializing in the designand test of planetary rovers. If Odyssey Moon carries the Beagle spectrometer, the factthe first Beagle Mars spacecraft "went missing without a trace" arethe kind of words that should generate a tremendous amount of "Britishpress." This could help scientists in the United Kingdom reclaim some lusterlost upon British politicians who too often believe the words "British andspace" are an oxymoron.